Reframe it was selected by USAID for an indefinite quantity contract to globally provide post-conflict peace building services in collaboration with FHI360, Deloitte, Mercy Corps, and others. 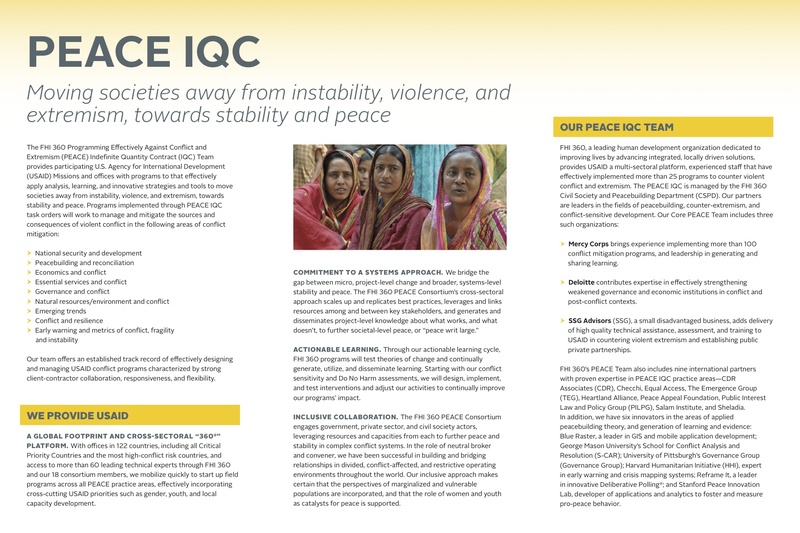 Learn more about this PEACE IQC in the document and brochure included below. Want the pdf versions? Download the document “USAID Programming Effectively Against Conflict and Extremism (PEACE) Indefinite Quantity Contract (IQC)”, or get the PEACE IQC brochure shown at bottom. A global footprint and cross-sectoral “360 degree” platform. With offices in 122 countries, including all Critical Priority Countries and the most high-conflict risk countries, and access to more than 60 leading technical experts through FHI 360 and our 18 consortium members, we mobilize quickly to start up field programs across all PEACE practice areas, effectively incorporating cross-cutting USAID priorities such as gender, youth, and capacity development. Actionable learning. Through our actionable learning cycle, FHI 360 programs will test theories of change and continually generate, utilize, and disseminate learning. Starting with our conflict sensitivity and Do No Harm assessments, we will design, implement, and test interventions and adjust our activities to continually improve our programs’ impact. Inclusive collaboration. 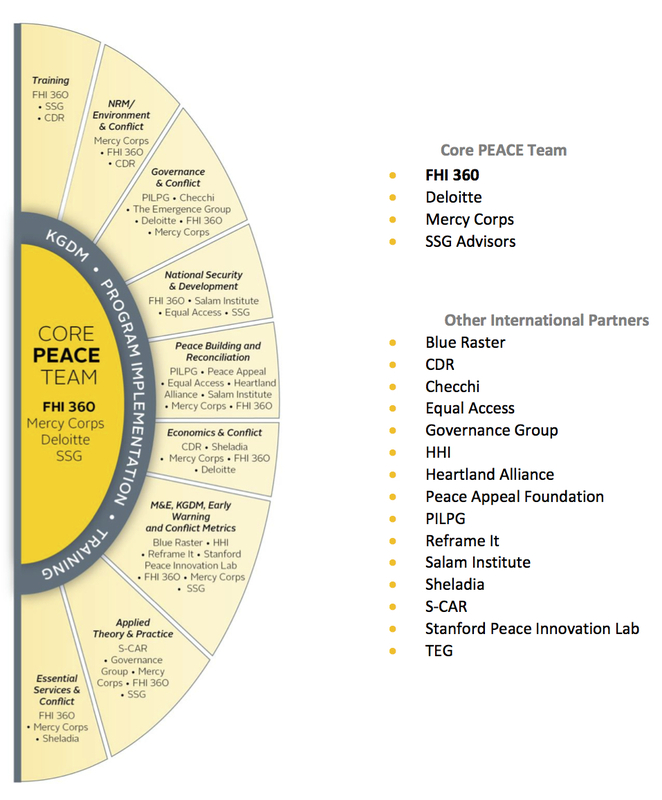 The FHI 360 PEACE Consortium engages government, private sector, and civil society actors, leveraging resources and capacities from each to further peace and stability in complex conflict systems. In the role of neutral broker and convener, we have been successful in building and bridging relationships in divided, conflict-affected, and restrictive operating environments throughout the world. Our inclusive approach makes certain that the perspectives of marginalized and vulnerable populations are incorporated, and that the role of women and youth as catalysts for peace is supported. Mercy Corps brings experience implementing more than 100 conflict mitigation programs, and leadership in generating and sharing learning. Deloitte contributes expertise in effectively strengthening weakened governance and economic institutions in conflict and post-conflict contexts. SSG Advisors (SSG), a small disadvantaged business, adds delivery of high quality technical assistance, assessment, and training to USAID in countering violent extremism and establishing public private partnerships. Humanitarian Initiative (HHI), expert in early warning and crisis mapping systems; Reframe It, a leader in innovative Deliberative Polling®; and Stanford Peace Innovation Lab, developer of applications and analytics to foster and measure pro-peace behavior. Contact the Contract Officer’s Representative (COR) in the USAID Office of Conflict Management and Mitigation (CMM). The COR is Elizabeth Drabant, [email protected] and the Alternate COR is Lisa M. Chandonnet-Bedoya, [email protected]. The ordering period for this IQC is August 30, 2013 to August 29, 2018. Any task orders issued in the first three years of the IQC cannot exceed a five year period of performance; any issued in the fourth year cannot exceed a three year period of performance and any issued in the fifth year cannot exceed a two year period of performance. 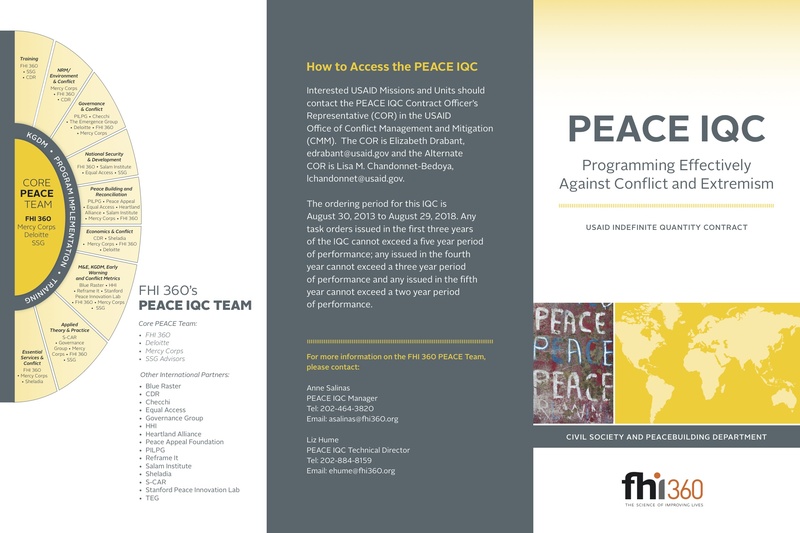 The PEACE IQC is managed by the FHI 360 Civil Society and Peacebuilding Department (CSPD). CSPD supports citizens to mobilize effectively to influence policy, improve lives, and build peace.